This is a delicious variation of the traditional almond Scandinavian coffeecake. Heat oven to 350°F (180°C). Place 1 cup flour in large bowl; cut in 1/2 cup butter with pastry blender until mixture resembles coarse crumbs. Stir in 2 tablespoons water. Press mixture into ball by hand. Divide in half. Pat each half to 12 x 3-inch rectangle about 3 inches apart on ungreased baking sheet. Set aside. Combine 1 cup water and 1/2 cup butter in 2-quart saucepan. Cook over medium heat until mixture comes to a full boil and butter is melted (6 to 8 minutes). Stir in maple extract. Remove from heat; stir in 1 cup flour. Reduce heat to low. Cook, stirring constantly, until mixture forms a ball (about 1 minute). Remove from heat. Beat in eggs, one at a time, with wire whisk or wooden spoon until smooth and glossy. Combine all glaze ingredients in small mixer bowl. Beat at low speed 1 minute. Beat at high speed until smooth and creamy, adding additional milk, 1 teaspoon at a time, until desired glazing consistency. Spread glaze over kringle. Sprinkle with nuts. Storage: Wrap in plastic food wrap or aluminum foil; refrigerate up to 2 days. Lemon Pecan Kringle - Omit maple extract in topping. Substitute 2 tablespoons fresh lemon juice and 2 teaspoons grated lemon peel. Omit maple extract and milk in glaze. Substitute 2 tablespoons fresh lemon juice. Almond Kringle - Omit maple extract in topping. Substitute 1 teaspoon almond extract. Omit maple extract in glaze. Substitute 1/2 teaspoon almond extract or 1 teaspoon vanilla extract. I have been searching the internet for maple pecan plait recipe. I've found recipes for Maple Pecan Tart and Maple Pecan Pie but they are not quite the same...I absolutely love eating this and... 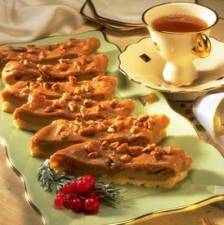 I love cake, in Portugal call pecan, is of oregiem dinamak, please to see the photograph in my blogs. Would also like a recipe for maple pecan nut plaits.